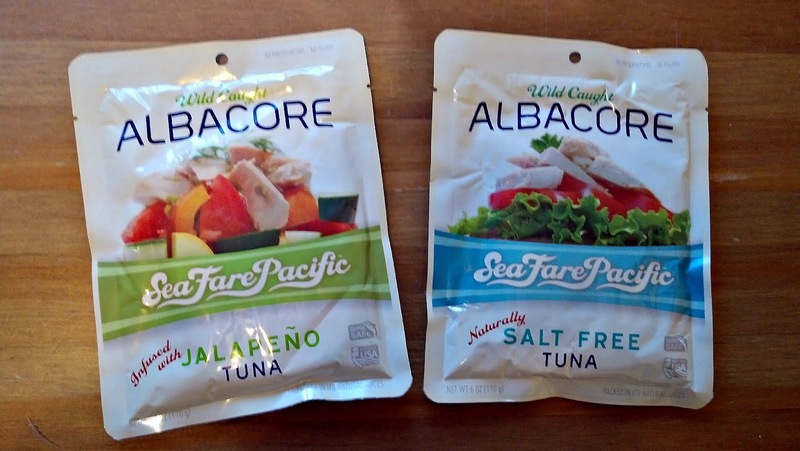 Sea Fare Pacific makes it easy to love tuna again! 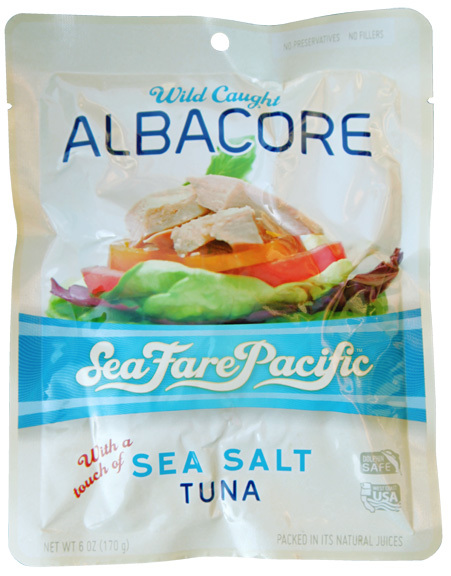 With Sea Fare Pacific's wild caught albacore tuna, you can be assured that your tuna and its packaging are free from GMO-ingredients, mercury, and BPA. In addition, this wonderful fish sea food is healthier than other typical tuna brands, because Sea Fare Pacific's tuna is only cooked once--and is cooked in its own nutritous fish oils. Read on to see how we prepared our tuna and what we thought of it! I also love pouched tuna because it is so portable and doesn't require draining. For those reasons, pouched tuna can be a great snack or meal item to keep in your office. Sea Fare Pacific premium pouched tuna has a shelf life of 3 years! Here is a picture of the Salt Free Tuna right out of the pouch. I noticed that it had a milder tuna smell than most canned tunas. I mixed in some Vegenaise and some sliced grape tomatoes so that I could enjoy a tuna sandwich. It was delicious with very tasty and mild tuna flavor. It was a really wonderful and nutritious lunchtime meal! My husband ate Sea Fare Pacific’s jalapeno pepper flavored albacore tuna as a tuna salad for dinner. He really enjoys spicier flavors and welcomed the opportunity to have a spicy dinner. The jalapeno tuna was very pretty with diced jalapeno and olive oil in it. It made a wonderful salad, and like I mentioned before, I couldn't even smell any "tuna smell" from across the table. To me, that means that this fish sea food is extremely fresh and well packaged. My husband said that the tuna was better than other tunas he has had in the past and that the jalapeno not too strong or spicy, but that it gave the tuna a great flavor. He was happy to have such a healthy, jalapeno-flavored dish for dinner! Overall, we can definitely recommend Sea Fare Pacific Tuna. From what I experienced in this fish sea food tuna review, the Sea Fare Pacific tuna was fresh and delicious. 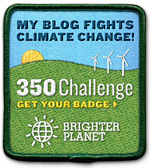 In addition to tasty tuna, I must also applaud them for their environmentally-safe and health-conscious practices. You can check out this fishing video from their YouTube page. Please also like Sea Fare Pacific on Twitter and Facebook and stay tuned for an upcoming Sea Fare Pacific Tuna Giveaway! Free Glasses from Firmoo Glasses! Natural Review Box Monthly Subscription! Free Prescription Glasses from Firmoo!